My boyfriend and I took a spontaneous trip to Target yesterday to buy tomatoes,zucchini, and an alarm clock. I know incredibly random. We were on the way to the front to check out when my boyfriend spotted the clearence section. I spotted nail polish there and he immediately went "Oh no why did I have to find this?" and jokingly rolled his eyes. I think he tolerates my nail polish addiction :P. I spotted this really pretty glittery top coat by Cover Girl called Pink Twinkle. It was originally $4.42, but it was on clearance for $2.12. I am SO excited about this find! I'm so used to seeing polishes with iridescent glitter that is on the cool side. The glitters flash blue or green. I haven't been able to find polishes were the iridescent glitter is warm and flashes pink and gold. 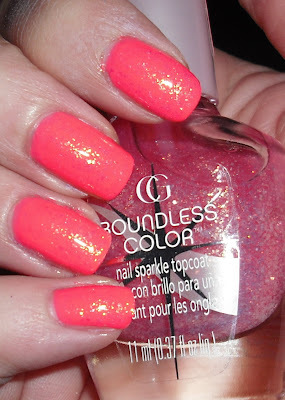 All that being said, Pink Twinkle is a sheer pink with pink and gold iridescent glitter. It's so pretty. 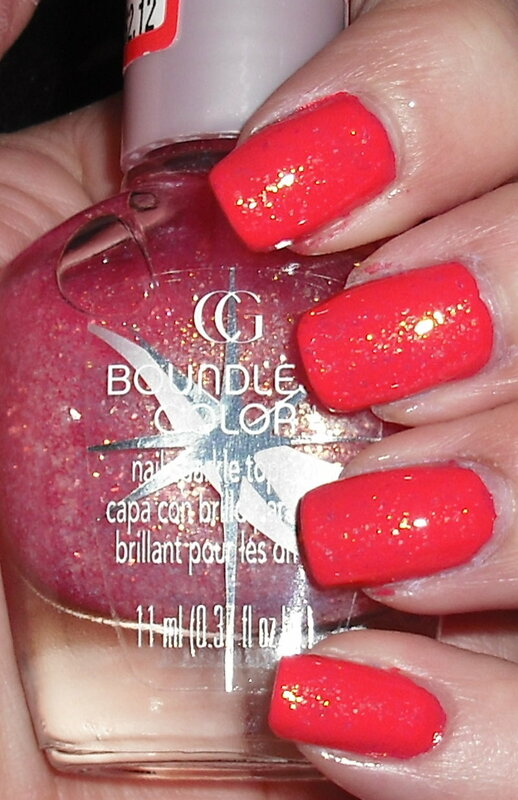 It looks like a sparkling sunset in a bottle! I think I like it better over the neon pink than the coral color. I'm thinking this would look great over a lighter orange too. You could layer it over anything you wanted really! Sounds like my hubby! HaHa - this is on my wishlist and it wasn't at my Super Target. Boo~ guess I'll have to keep looking it's so purdy. That looks great! Are those flakies? ooo love it, great find! I had almost the same thing happen! Hubby and I ran to Target to get a few very random things. One was even an alarm clock! LOL! I'm the one who spotted the clearance though. I found Pink Twinkle, and had to buy it. I am in love with it! :-) It looks great on you....I'm thinking I want to try to find the rest of these now. I think there is a purple,orange and reddish one as well. lucky! I had a nice enough day- the professor made a funny joke, he said the study of space and its birth/death is cosmology, but it should be called cosmetology because it's the study of the "make-up" of the universe... bahah. I giggled. Melanie-Thank you for sharing. I just started following. @Lily Nail @Oh My Polish- Thanks! Ali-You never know when you need an alarm clock. My bf is making fun of the one I got because each number is a different color. He calls it a clown clock..but I like it :P. I'm glad you found Pink Twinkle. I love Cover Girl glitter top coats. I need to get the purple one. I have City Lights, Crystal Mist, Gold Rush, & Ruby Dust they're all great! Lacquer-Oooo I'd love a purple jelly franken made out of this. I may have to get the other bottle I saw and experiment! Tara-Haha, that's good sounds like you have a funny professor. That always makes a class more fun!